Jagannath is the Lord of the Kali Yuga – the form Lord Visnu takes to govern the last of the four Yugas in popular conception. But there is a mystery associated with true identity of Jagannath which has intrigued scholars for a long time. Some have speculated that the temple was originally a Baudha temple with triple figure of Jagannatha, Balarama and Subhadra being representative of the triranta of Buddhism – Buddha, Dharma and Sangha. Additionally in many Pali texts Buddha is often referred to as Jagannatha and given that influence of Asoka in the Kalinga region was historically important, it became easy for some to believe that it may have been a temple to Buddha at some ancient time. However, this argument is not entirely accetable given that the actual number of vigrahas inside the sanctum are not 3, but 4 – sudarshana being the 4th! The Agni Purana, Padma Purana, Brahma Purana, Narada Purana and Skanda Purana use the term ‘Chaturddhamurti’ to describe the deities inside the sanctum of the Puri temple. The Dhauli region of Odisha was once a Buddhist centre particularly after the Kalinga War of Ashoka. It is therefore, likely that Buddhism might have exercised some influence over the cult of Jagannath. Possibly, there arose a conflict between the Buddhists and the Hindus in the 7th or 8th century as a result of which Indrabhuti, a Buddhist of Sambalpur region effected a compromise by using the epithet Jagannath as a synonym of Buddha in his work ‘Jnana Siddhi’. It is believed that inside the murti of devatas in Jagannatha temple, there resides a sacred object of great power and spiritual potency. Every 12 years when a new murti is consecrated this power is transfered from the older murti into the new one by a priest in a secret ritual performed behind closed doors. Some speculate that the object is a body part, a tooth, of the historical Saykamuni. Others have a more farfeteched belief, that when Lord Krshna was leaving his body a stone nearby got imprinted by his supernatural energy and this stone now resides inside the vigraha. Another speculation is that the vigrahas contain specially consecrated Shaligramas placed inside Tantric Yantra-s of three Mahavidyas- Kali, Tara and Bhuvaneshwari. Other Tantric literature considers Jagannatha as Mahabhairava and Bimala devi as the MahabhairavI and the whole area of the temple as a chakra wherein one loses his/her caste when consuming the Mahaprasada of Jagannatha. Perhaps this association between Shakta and Vaishnava ideas created a sort of merging between the two paths in eastern India leading to some Tantric texts declaring unquivocally that Krshna and Kali are the same deity appearing in two different perspectives! The Lord is also at times considered as Surya and mantras related to Surya are chanted while performing the ritual worship to the devata. In Jagannatha we find a complete amalgamtion of Vaishnava, Shakta, Saurya and Tantric paths. There are some medieval spiritual literature which regard him as daru brahma – Brahman manifesting as wood, since the vigraha is wooden. 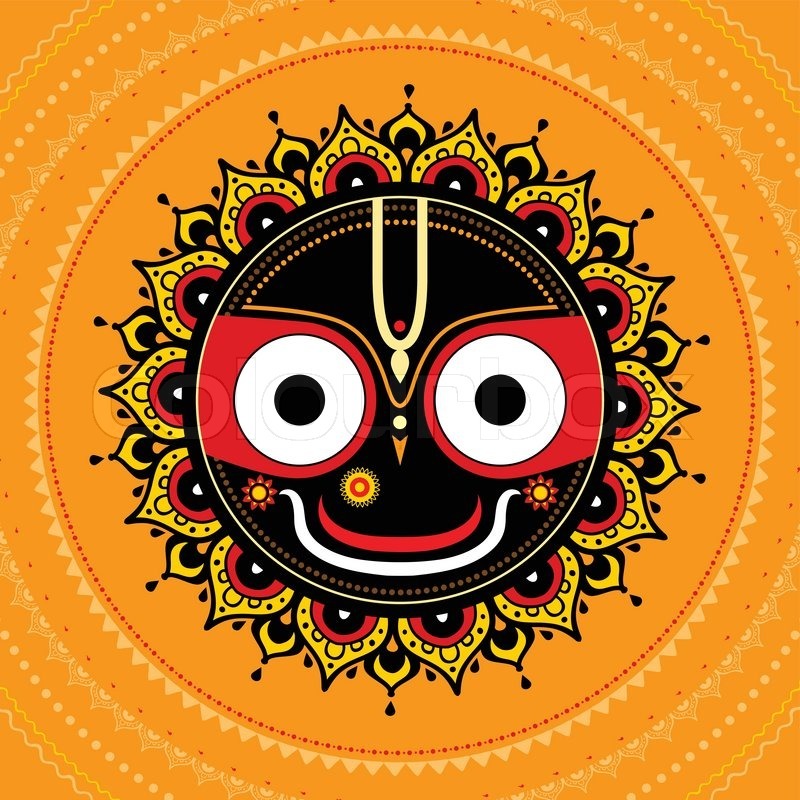 Sometimes Jagannatha is also refered to as Shunya Brahman – the void manifesting in a personal form! Some have even speculated that originally it was Narasimha temple, manifesting a Krodha Narasimha, because Narasimha mantras are traditionally used for certain crucial aspects of the Puja like protecting the Mahaprasada or during the Navakalevara 0r ritual transferance of Prana from the older murtis to the new one. Even though it is a predominantly Vaishnava pitha, its Tantric roots are not ignored – during the Sandhi Puja of Navaratra-s an animal is sacrificed infront of Bimala devi and the head and blood is offered to the Shakti of the Kshetra. Of the various associations made with Jagannath the most prominent is his association with the term Sri Purushottama. The Gita mentions that beyond both the kshara and akshara purusha stands the Purushottama, who is the Lord’s ultimate power manifesting both as the Silent obesever and the detached actor in the world of creation. It is impossible to know how one must worship the Purushottama perfectly, but an objective study of the rituals shows it is a eclectic mix from various path, and a beautiful manner of personalizing the impersonal through strains of bhakti-based seva. jagannathah svami nayana–patha–gami bhavatu me.. It is a delight to read your posts..one wishes it would go and on! Much gratitude for this site.